DENVER (AP) — Adam Frazier has been doing damage with his bat lately. But it was his glove that helped Pittsburgh take a series in Colorado. 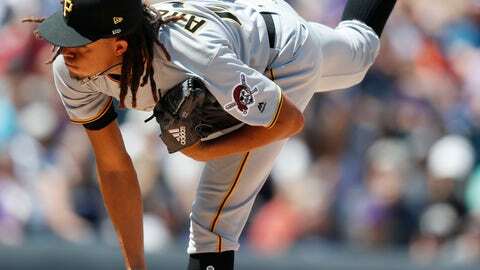 Frazier had three hits and made a run-saving play in the field, and the Pirates beat the Colorado Rockies 4-3 on Wednesday. Felipe Vazquez got the last four outs for his 26th save. Frazier had two doubles and a single, but made what might have been his biggest contribution on defense. With runners on the corners and two outs in the eighth inning, pinch-hitter Chris Iannetta hit a sharp grounder to the hole at second. Frazier made a diving stop and threw out Iannetta to end the inning and preserve the one-run lead. His defense complemented a hot stretch at the plate. He got three hits in his first three at-bats and has raised his average 41 points to .280 over the past two weeks. “He’s been in a good place on both sides of the ball,” manager Clint Hurdle said. Colorado scored just six runs in the three-game series. Archer retired the first eight batters before Marquez singled in the third. Colorado broke through in the fourth on Dahl’s two run homer, his fifth of the season, to cut the deficit to 3-2. The Pirates added a run on Corey Dickerson’s sacrifice fly in the eighth inning to make it 4-2. Ryan McMahon’s RBI single made it close again. Rockies: LHP Chris Rusin (plantar faciitis) pitched in a rehab assignment Tuesday night and was at Coors Field on Wednesday. Manager Bud Black said Rusin will be evaluated. “We’re encouraged by a lot of things we saw in his three outings,” Black said. Archer spent a lot of Tuesday in bed trying to shake off a bug that had Hurdle wondering if he would start Wednesday. Archer said he wasn’t sure what hit him, but suspected it was food poisoning. He said he felt a lot better when he woke up Wednesday morning. “I wasn’t aware of that but I’m glad to be on that list,” Marquez said. Marquez followed his perfect inning with a leadoff walk in the fifth to Cervelli.